Breathing Pattern Disorders (BPD) (or Dysfunctional Breathing) are abnormal respiratory patterns in relation to over-breathing which ranges from simple upper chest breathing to, at the extreme end of the scale, hyperventilation. Dysfunctional breathing (DB) is defined as chronic or recurrent changes in breathing pattern that cannot be attributed to a specific medical diagnosis, causing respiratory and non-respiratory complaints. This is not a disease process, simply alterations in breathing patterns that interfere with normal respiratory processes. They can however, co-exist with disease such as COPD or heart disease, and in some cases can mimic cardiac symptoms. BPDs are whole person problems, especially in long term conditions where dysfunctional breathing can destabilise mind and muscles, mood and metabolism. They can play a part in, for instance, premenstrual syndrome, chronic fatigue, neck, back and pelvic pain, fibromyalgia and some aspects of anxiety and depression. The Human respiratory system is located in the thorax. The thoracic wall consists of skeletal and muscular components, extending between 1st rib superiorly and rib 12th, the costal margin and the xiphoid process inferiorly. The respiratory system can be classified in terms of function and its anatomy. Functionally, it is divided into two zones. The conducting zone, extend from the nose to the bronchioles, serves as a pathway for conduction of inhaled gases while the respiratory zone, is the site for gaseous exchange. It comprises of alveolar duct, alveolar sac and alveoli. Anatomically, it is divided into upper and lower respiratory tract. The upper respiratory tract starts proximally from the nose and ends at the larynx while the lower respiratory tract continue from the trachea to the alveoli distally. Little is known about dysfunctional breathing in children. Preliminary data suggest 5.3% or more of children with asthma have dysfunctional breathing and that, unlike in adults, it is associated with poorer asthma control. It is not known what proportion of the general pediatric population is affected. As well as having a marked effect on the biochemistry of the body BPD can influence emotions, circulation, digestive function as well as musculoskeletal structures involved in the respiratory process. Essentially a sympathetic state and a subtle, yet a fairly constant state of fight-or-flight becomes prevalent. This can lead to changes in anxiety, blood pH, muscle tone, pain threshold, and many central and peripheral nervous system symptoms. So, despite not being a disease, BPDs are capable of producing symptoms that mimic pathological processes. For example, overuse of accessory breathing muscles can lead to neck and shoulder pain/dysfunction. Some even mimic cardiac and gastrointestinal problems. 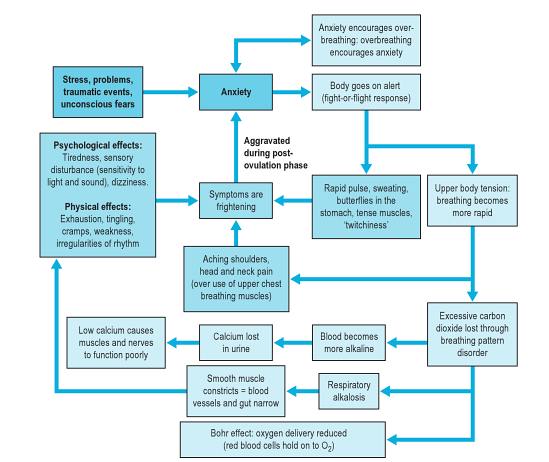 This diagram (from ) shows the stress-anxiety-breathing flow chart demonstrating multiple possible effects and influences of breathing pattern disorders. Breath Holding – People can normally hold their breath between 25 and 30 seconds. If less than 15 seconds may mean low tolerance to carbon dioxide. Breathing Hi-Low Test (seated or supine) – Hands on chest and stomach, breathe normal – what moves first? What moves most? Looking for lateral expansion and upward hand pivot. Breathing Wave – Lay prone, breathe normal, spine should flex in a wave-like pattern towards head. Segments that rise as a group may represent thoracic restrictions. Seated Lateral Expansion – Place hands on lower thorax and monitor motion while breathing. Looking for symmetrical lateral expansion. Manual Assessment of Respiratory Motion (MARM) - Assess and quantify breathing pattern, in particular the distribution of breathing motion between the upper and lower parts of the rib cage and abdomen under various conditions. It is a manual technique that once acquired is practical, quick and inexpensive. elevated and depressed ribs and clavicle. muscle tone and length especially psoas, QL, latissimus, upper trap, scalene, and SCM. alterations in mobility of thoracic and rib articulations. Management commonly requires the removal of causative factors and the rehabilitation of habitual acquired dysfunctional breathing patterns. In order to achieve this most efficiently it may be necessary to restore normal function of the respiratory system such as thoracic mobility and muscle tone and length. 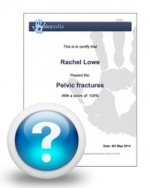 Based on your assessment, there are several manual therapy techniques that can be performed to treat muscles that have increased tone or activity, elevated and depressed ribs and alterations in mobility of thoracic articulations. These techniques include muscle energy techniques (MET), positional release, trigger point release and integrated neuromuscular inhibition techniques. Awareness of normal breathing rates and rhythms, both at rest, during speech and activity. Pursed lip breathing has been shown to relieve dyspnoea, slow respiratory rate, increase tidal volume, and restore diaphragmatic function. BPDs can often mimic more serious conditions such as cardiac, neurological and gastrointestinal conditions which must all be ruled out by the medical team. Breathing pattern disorders and functional movement. Bradley H, Dr Esformes J. Int J Sports Phys Ther. 2014 Feb;9(1):28-39. Breathing exercises for dysfunctional breathing/hyperventilation syndrome in children. Barker NJ, Jones M, O'Connell NE, Everard ML. Cochrane Database Syst Rev. 2013 Dec 18;12:CD010376. Breathing exercises for dysfunctional breathing/hyperventilation syndrome in adults. Jones M, Harvey A, Marston L, O'Connell NE. Cochrane Database Syst Rev. 2013 May 31;5:CD009041. ↑ 1.0 1.1 Lum L 1987 Hyperventilation syndromes in medicine and psychiatry: a review. J. R Soc Med. 80:229-231. ↑ 14.0 14.1 Thomas M1, McKinley RK, Freeman E, Foy C, Price D.The prevalence of dysfunctional breathing in adults in the community with and without asthma. Prim Care Respir J. 2005 Apr;14(2):78-82. ↑ Barker, Nicola J et al. Breathing exercises for dysfunctional breathing/hyperventilation syndrome in children. National Library of Medicine. The Cochrane database of systematic reviews12 (2013): CD010376. ↑ Biff F. Palmer 2012 Evaluation and Treatment of Respiratory Alkalosis Am J Kidney Dis. 60(5):834-838.